Filmi Santa brought me a surprise from the most glorious royal palace of Pitustan! "Allow yourself to melt into Eau de Shashi. A fragrance rendolent of musk, heaving bosoms, and sultry nights.... A fragrance forbidden to all but the most desirable of women. 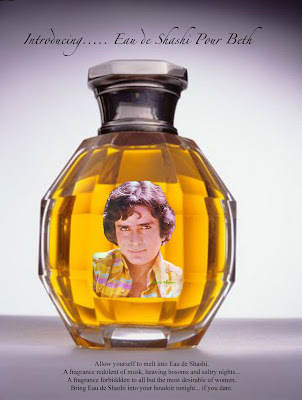 Bring Eau de Shashi into your boudoir tonight...if you dare." Do they make it in bigger size? LOL!!! i enjoy reading your blog, just a question do you know whatever happened to shashi's son karan? he was in one or two films and then didn't quite make it, too white I guess, because of that India had to live without a kapoor hero for nearly two decades until ranbir came along. maybe you should do a post about him. Yay! Glad u liked it! Beth, I watched Karan's film Loha years ago. It was actually Dharmendra film but he was in there. He's an okay sort of actor. Loha is a good action movie though, worth watching it, IMO. I would love to watch it again sometime. No idea what he does these days. Didn't Karan have a brother and a sister? I think they were never in movies if my vague memory is right. Kanan - Yes, he does. Kunal is the oldest Shashi-Jennifer child and was in a few films, most namely Vijeta, I think (though I haven't seen it). I believe he now makes ad films? Something like that. He's also married to Ramesh Sippy's daughter Sheena. Baby sister Sanjana runs Prithvi Theatre in Mumbai. She sounds like an amazing person. Sanjana was in Salaam Bombay! but it wasn't a very big part. She played a Western journalist doing an interview. She's been in other things but I haven't seen any of them. Are there any more bottles in exisetence? If yes, where do i order one? I want to dare, too!